The take off of the Eritrean Airlines plane is delayed by one hour. We have to wait for 20 missing passengers, expected to transfer from a flight from the USA that is delayed. Most of the passengers are Eritreans from Europe, some tourists and a few Italians that will accompany us to the stopover at Milan Malpensa. The staff of the Eritrean Airlines plane gives you a feel of being in Eritrea from the moment you have boarded the plane. 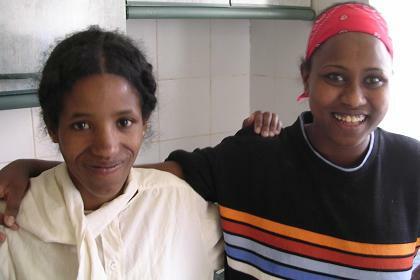 Typical Eritrean friendliness, politeness and hospitality. I recognize some of them from the previous flights last year. "Thank you for the photo's". They all are proud of their airline, that has just celebrated its first anniversary. No problem to make some pictures. At the airport in Milan I explain my plans in Eritrea to captain Isaias. I ask if I can visit his cockpit later, when flying to Asmara. During the flight to Eritrea, the flight attendants sell tax free whisky. Last chance to buy a gift for my host, Feshaye, who will be waiting for me at Asmara International Airport. My visit to captain Isaias' and flight officer Jonathans' cockpit is like meeting friends. We talk about our families and about Eritrea. When we have touched the runway in Asmara, there is an enthusiast applause. Women make typical Eritrean sounds expressing joy. We are home, and so am I, longing to meet all friends, to enjoy the sun, the smiles, and unfolding my plans for the next three weeks. Walking from the plane to the airport buildings, I witness the Eritrean passengers photographing the plane. It is not allowed to make pictures at the airport, but who cares? It is dark. Nothing special to see except the plane. So I join them. Check, check, double check. Polite, but accurate. I hand the entry form received and written in the plane to the Eritrean military police. At the next counter, I fill in a form to declare the video equipment. The procedures are very familiar to me. I get myself one of the luggage carts and wait patiently for the suitcases. The luggage belt is short. Too short for the many packages and suitcases. The porter tears the largest ones from the belt to prevent congestion. When I have collected my luggage, I follow the instructions of the airport personnel, who direct the foreigners to the exit. Everything is well organized. And everyone is friendly. "Welcome to Eritrea, sir!" At the fence of the airport compound Feshaye is awaiting me with the company car, a Toyota Hilux double cab. Hundreds of Eritreans are waiting to meet their friends and relatives that arrived. Taxi's are waiting for those who might need them. I hand the bag with the Johnny Walker to Feshaye. "It's yours now, so be careful with it". I shake hands with Hiab, the four year old son of Feshaye and Terhas. He is shy. It will take a few hours to get used to me again. After dropping my luggage in the apartment, two kilometers from the airport, we visit Pizzeria Eritrea, where Terhas invites me to eat one of her delicious pizza's as a welcome meal. 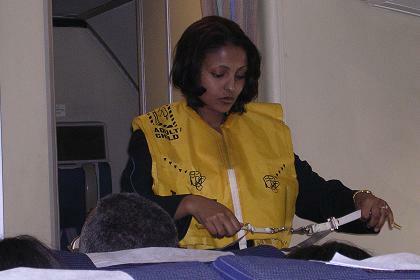 Flight attendant Salem demonstrating the life vests. 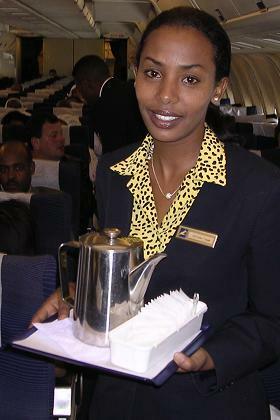 Flight attendant Eden serving coffee on the flight to Asmara. 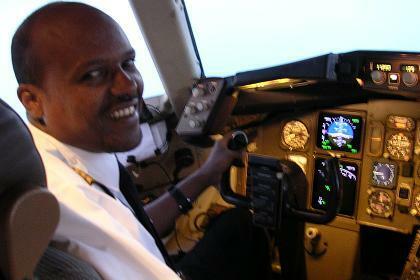 Captain Isaias in the cockpit of the Eritrean Airlines Boeing 767. 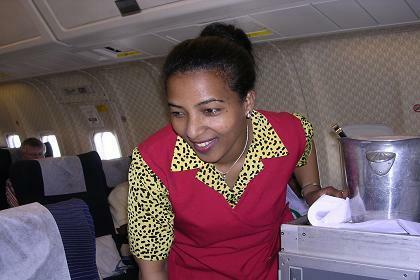 Senior flight attendant Shewaye serving drinks on the flight to Asmara. 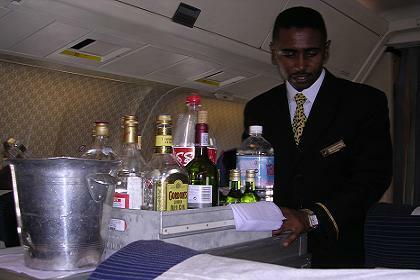 Flight attendant Solomon serving drinks on the flight to Asmara. 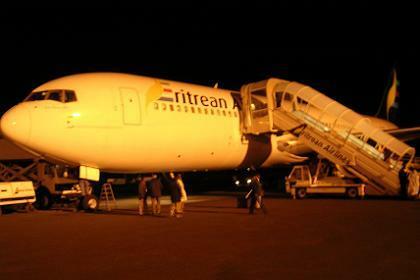 The Eritrean Airlines Boeing 767 at Asmara International Airport. Terhas and her two children, Hiab and Elilta. 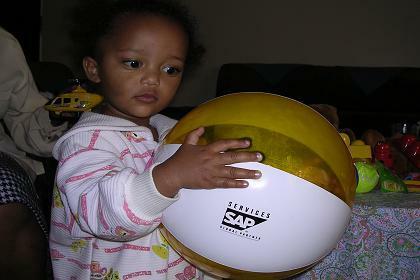 Elilta, studying the inflated beach ball (thank you Leny van Galen). 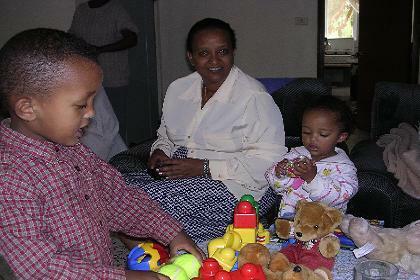 Tsege and Ghenet, taking care of Terhas children and me. 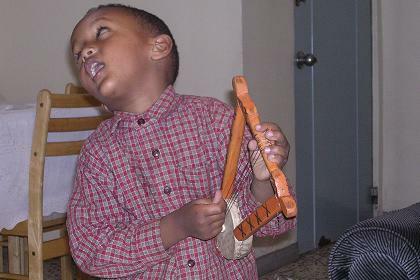 Hiab singing and playing on his krar.